Have you looked at the suspension on a modern bike recently? It has adjustability, and lots of it. And that's a problem.Trouble is, how many of us can honestly put our hands up and say we know what all those various adjusters actually do? Not many, I bet. But that doesn't stop fiddling fingers. With so much adjustment within such easy reach it's not hard to get it all wrong and turn a good handling bike into a dodgy shopping trolley. But, on the flip side, it's also fairly easy to turn a bike that doesn't handle well into one that does. And while there are various suspension guides printed these shouldn't be rigidly adhered to, because what works for one person may not suit your style, ability, weight or the use you're putting the bike to. Suspension needs to be individually tailored. So rather than simply try and tell you what your suspension does and how it does it, we devised a series of tests to help describe what badly set-up suspension feels like. Each test was done without the riders - Niall and myself - knowing what had been adjusted, and the comments printed with each adjustment are simply a description of what the bike felt like compared to the standard suspension settings. In each case one variable was altered to either its maximum or minimum setting, while the rest of the bike was left on standard settings. Neither Niall nor myself knew what had been adjusted and we didn't confer until after the test was finished. If you're fiddling with your suspension the most important thing is not to change too many things at one time, and always make notes as you go. Ideally change only one thing at a time, then ride the bike along a familiar stretch of road to see if it has been made better or worse. Only then should you try altering something else. And finally, if all else fails, get your owner's manual out and put everything back to standard settings. They are often the best compromise. Niall: "Through the faster corners the back end didn't feel in control. The tyre slid a bit, not enough to really let go, but there was definite movement, almost like the tyre had gone off." Jon: "The back felt awful, turning into slower corners I really had to force the thing to turn with loads of pressure on the bars, and it kept running wide and wobbling mid corner." What's actually happening: With no compression damping there's less slowing the shock's tendency to squat down, so it starts working against the spring quicker. This makes the bike sit down low at the back, which in turn slows down the steering. Niall: "The bike felt really high at the front. It was okay on the brakes but exiting corners it ran wide and wandered about." Jon: "The steering was really slow, like turning though treacle. Going around the Melbourne Loop was terrifying; shut the throttle mid-corner and it wobbled like crazy. I had no confidence in what the front was doing, and like before was really having to force it to turn." What's actually happening: Again, there's nothing to help support the compression of the fork spring so the bike sits lower at the front under load, putting weight forward and adversely affecting the handling. Niall: "The front felt really harsh, very unforgiving, and it gave the whole bike a hard feeling. It didn't track at all over bumps and felt far too stiff. Not very nice." Jon: "The front end felt like a rock. I noticed bumps that I hadn't before and the front seemed to patter on fast corners. Braking hard into the Melbourne Loop I out-braked myself as the front didn't dive at all." What's actually happening: With too much compression damping the suspension can't travel through its natural movement and the fork spring isn't able to absorb the bumps as easily. Niall: "It felt really harsh and 'up' at the front. The rear felt like it was skimming on the exit of corners when the bike was under power. It started to run wide as soon as the power was on then skipped around"
Jon: "After the last test this felt really soft on the forks. The bike seemed to handle almost as well as it did on stock settings but seemed to have lost some ground clearance." What's actually happening: Once the shock is compressed it can't return it to its uncompressed state. The back of the bike is held down, making the front feel high and leading to the bike running wide. Niall: "There's a lack of feeling of control from the rear. It steered okay and the front was planted, but the rear tended to weave through fast corners. It's not that bad, but could certainly be improved on." Jon: "The bike didn't feel that bad, a bit low at the back but nothing too bad. It didn't feel too balanced, especially at speed." What's actually happening: Once the shock is compressed the rebound controls how quickly the shock returns up from its stroke. With minimum damping the shock is always trying to return as quickly as possible, upsetting the bike. Niall: "There's almost no resistance against the brakes and the front has a dead feeling about it. Turning in on the brakes it feels heavy, lazy and doesn't give any feedback as to what the tyre is doing." Jon: "The patter over the bumps is back but it doesn't feel that bad. I was happy going fast on it but the front has a definite harsh feeling." What's actually happening: With the forks compressed, too much rebound damping won't let them return once the forces are reduced. This keeps the front end of the bike down and unsettles the handling. Niall: "This feels really good, almost better than standard. I honestly feel perfectly happy. The front feels stock and the rear is nicely supported. The best change so far." Jon: "This felt really good. The front is fine, slightly soft if anything but fine, and the rear perfect. 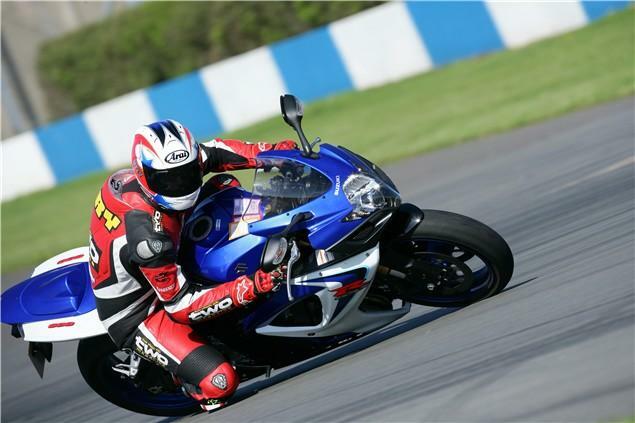 The bike moved slightly when I picked it up and braked hard, but overall good." What's actually happening: Too much compression damping stops the shock absorbing energy, potentially making the ride harsh. But Donington is smooth, which is why this wasn't a problem - and even an improvement over standard. Niall: "It felt really stiff and high on the front. When I was braking the bike pushed back up really hard, but it still turned okay." Jon: "It felt like standard settings, I didn't have a problem at all." What's actually happening: The forks are extending from their compression stroke faster than normal as the damping isn't holding them down. This can force the bike to sit up more, especially once the forces are off. Niall noticed it more because he works the front end harder in corners and goes from a closed to fully open throttle faster than Jon, and indeed most people. Niall: "The front feels all out of control under braking. The back is moving around and it doesn't feel like the front is diving under brakes. There is also a bit of chatter over bumps. Not very nice." Jon: "The bike felt okay but was slightly soft and quick to dive under braking. It didn't feel much different to standard and still cornered fine." What's actually happening: With the springs fully preloaded the bike sits too high at the front. The forks aren't compressing enough under load and the bike isn't transferring its weight to the front wheel. Effectively the bike sits 'flatter' under braking, which destabilises it. Niall: "Trying to drive out of corners the back squatted down and the bike ran wide. When I put the power down out of slow corners it ran wide, and through faster ones, such as Schwantz's, it pogoed slightly." Jon: "The bike felt flat in corners and didn't really feel like the back end was digging in when I drove out. Under braking the rear seemed to slide around and wasn't balanced." What's actually happening: The rear spring is under less initial pressure so when the bike's weight transfers backwards under acceleration it sags and sits down before the spring can start to work properly. Niall: "It wasn't so much a problem on the brakes, more mid corner. The bike wanted to fall into the corner and it felt like the front was trying to tuck all the time. Mid corner the bike felt horrible, all squidgy and wobbly on the front." Jon: "Over bumps the front felt really unsettled and the patter was back. In corners it wasn't that bad, a bit soft feeling but nothing too bad." What's actually happening: Again, the spring isn't under as much initial pressure when the bike loads it up, so the initial movement before the spring starts to work gives a saggy, soft feeling. Niall: "On the brakes the back end was all over the place. I'd hit the brakes then the rear was well out of control, it just swayed back and forth and meant I had to let off slightly to get it back under control." Jon: "The back felt hard and the bumps, especially through the Foggy Esses, gave me a right kick up the arse. 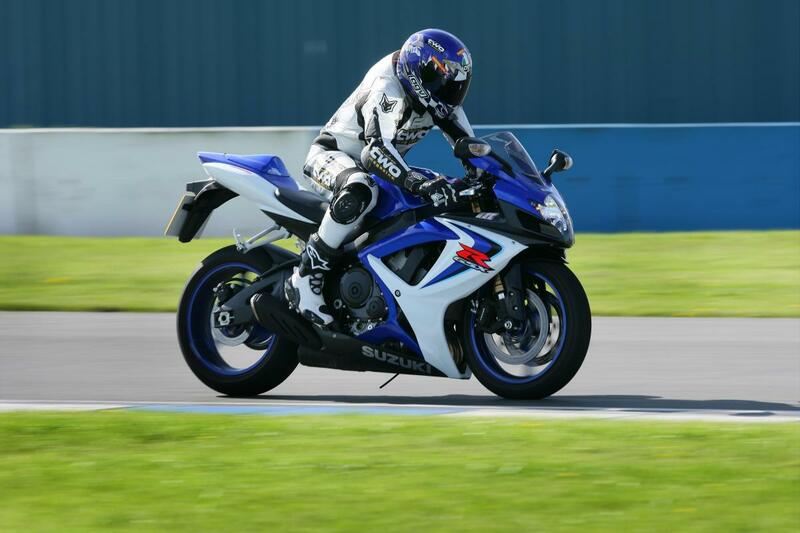 Under braking the bike didn't feel very planted and the rear slid around slightly." What's actually happening: The spring already has pressure on it so there is less 'give' in it to absorb the new forces, or just the weight of bike and rider. This leads to a harsh ride. Niall: "It feels just like a flat tyre. The bike is heavy to turn and squirms around under power making it hard work to ride." Jon: "I can feel the back tyre moving around, almost like a motocross tyre on the road. It feels soft and wobbly and the bike is hard work to turn." What's actually happening: The tyre's flat, stupid. Air pressure in the tyre helps it to hold its shape and rigidity so the rubber can grip without moving around. With the pressure low the tyre's carcass moves more. This movement will lead to increased tyre wear and overheating. Not good. At all. Both Niall and myself were surprised by how much difference the changes we made affected the bike. The problem is that manufacturers only build in a limited amount of adjustability for safely reasons. Too much and it would be possible for owners to make their bike dangerously unstable, which could potentially lead to accidents and law suits. Although the changes we made were fairly extreme the results offer a fair guide to what to look out for should you want to start fiddling with your suspension. HAVE YOU LOOKED at the suspension on a modern bike recently? It has adjustability, and lots of it. And that's a problem. Trouble is, how many of us can honestly put our hands up and say we know what all those various adjusters actually do? Not many, I bet. But that doesn't stop fiddling fingers. something else. And finally, if all else fails, get your owner's manual out and put everything back to standard settings. They are often the best compromise. Niall "Through the faster corners the back end didn't feel in control. The tyre slid a bit, not enough to really let go, but there was definite movement, almost like the tyre had gone off." Jon "The back felt awful, turning into slower corners I really had to force the thing to turn with loads of pressure on the bars, and it kept running wide and wobbling mid corner." Jon "The steering was really slow, like turning though treacle. Going around the Melbourne Loop was terrifying; shut the throttle mid-corner and it wobbled like crazy. I had no confidence in what the front was doing, and like before was really having to force it to turn." Click here for motorcycle suspension tuning page two.